The SAND MAN is a light- weight, easily maneuverable, walk behind sand sifter. The sieving unit is compact enough to be transported in the bed of a pickup truck and lightweight enough to be unloaded by one person. Independent brakes on each wheel and a differential lock, which assists in soft sand conditions, aid maneuverability. The walk behind sand sifter is propelled by high flotation rubber tires, which provide excellent traction in sand but will not harm grass or paved surfaces. The SAND MAN is powered by a reliable, noise restricted, 5.5HP HONDA gasoline engine. 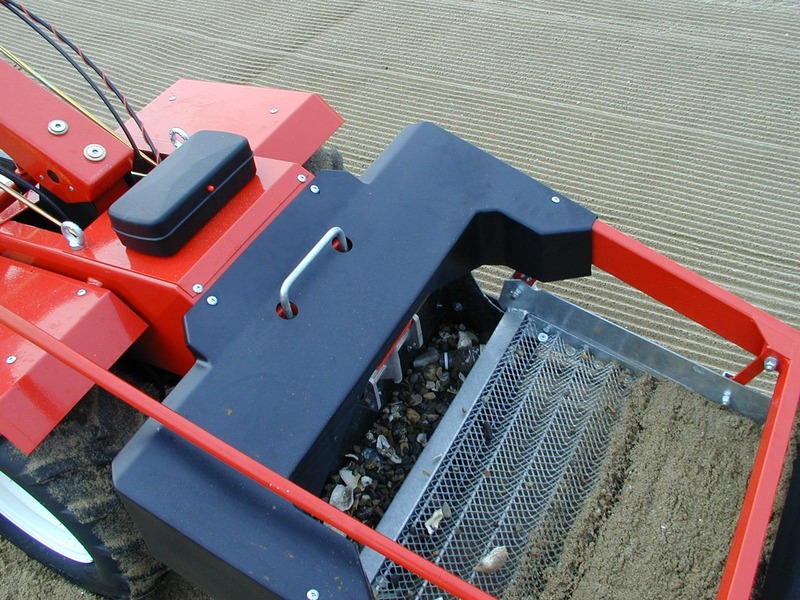 The SAND MAN sand sifter elevates the sand and utilizes a sifting screen to sieve the debris. The debris is then deposited into the collector. There are three interchangeable screens with mesh sizes of 3/16", 3/8" & 1/2". Different sieve size is determined by the application. The sand sifter's smaller mesh is used for ultra fine cleaning and the larger mesh allows for deeper cleaning and rapid sifting speed in wet sand. The operator, while the machine is in use, can easily adjust the cleaning depth, from 0-4". The 5.3 gallon (20 liter) collector can be easily emptied into either of the on-board storage hoppers for a total capacity of 14 gallons (54 liters).